The Ponte Vecchio - 'Old Bridge' - is one of the most famous landmarks of Florence and it is one of the city's few sights that is free to visit. 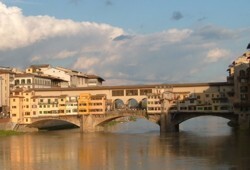 There has been a bridge spanning the river Arno close to this spot since Roman times. The current stone bridge was built in 1345, bearing 43 shops on its three arches, and replaced an eleventh-century wooden structure. Over the top of the medieval shops runs the Vasari Corridor (Corridoio Vasariano), built in 1565 as a private passageway for the Grand Dukes, linking the Palazzo della Signoria and the Uffizi with the Pitti Palace. Until the end of the sixteenth century there were all kinds of shops on the bridge, but this proved too smelly and untidy for Florence's rulers: it was ordered that only jewellers and goldsmiths should be allowed to do business here. Nowadays, the shops on the bridge still glint with gold and jewels, and this traditional Florentine trade is commemorated on the centre of the bridge by a bust of Benvenuto Cellini, among the most famous of the town's goldsmiths. In the great floods of 1966 many valuables were washed away down the river from these shops. The bridge has endured numerous fires and floods over the centuries, but perhaps came closest to destruction in 1944, during the Second World War. As the Germans retreated before the Allies, they blew up all Florence's bridges apart from the Ponte Vecchio, instead blocking its ends with rubble from demolished buildings. The Ponte Vecchio is just south of Piazza della Signoria in the heart of Florence, close to the town's other attractions. For the best views, wander along the banks or walk to the neighbouring bridges, the Ponte alle Grazie and the Ponte Santa Trinita.